In my quest to find new exotic fruits to try, I had the pleasure of eating snake fruit during my recent travels through Southeast Asia. 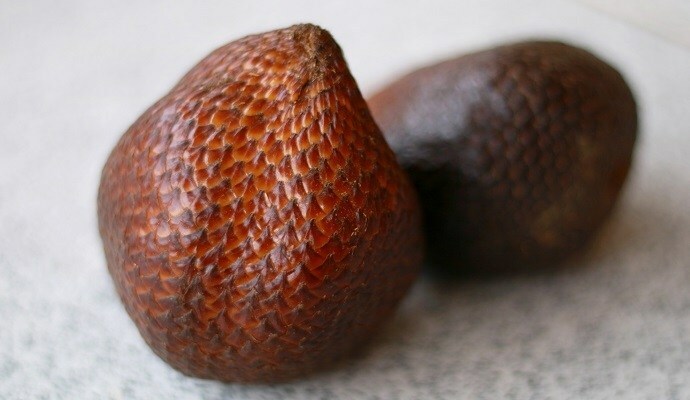 While snake fruit, also known as salak, is perhaps not as delicious and refreshing as other exotic fruits I’ve tried, I was still pleasantly surprised by the unique flavors and texture of this fruit. So let’s find out a bit more about this peculiar tropical fruit, its nutritional profile and its health benefits. The snake fruit is produced by the salak tree, a palm tree family native to Sumatra and Java in Indonesia. Salak is now also being cultivated in other regions in and around Indonesia, resulting in different variations of the fruit. The shape and size of a snake fruit resemble that of a fig, with a distinct tip. 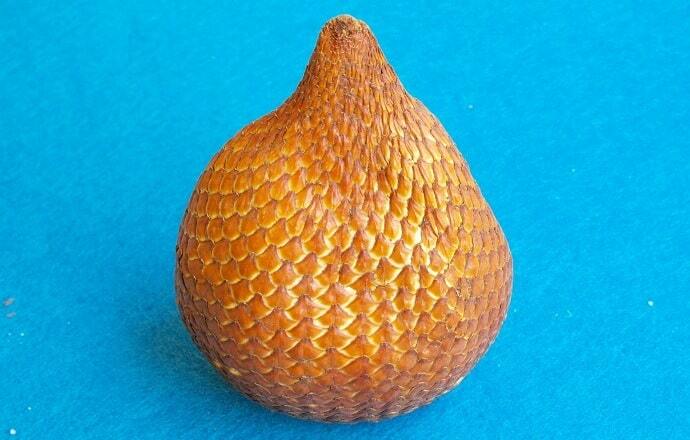 However, it’s the dark, scaly skin of this tropical fruit that gave it its name. Perhaps the best spot to find and try snake fruit is Bali, one of Indonesia’s most popular tourist destinations. The fruit is relatively popular there, just like so many other tropical fruits are. Otherwise, you will most likely also be able to find the fruit in Bangkok and other popular areas in Thailand. How to Eat Snake Fruit? The best way to eat a snake fruit is by removing the stem and then cracking the fruit open. You then simply peel off the skin. Interestingly enough, the inside of a snake fruit looks very much like large garlic cloves. Once you’ve peeled one, you will understand what I mean! Inside you will see three lobes, two larger ones and a smaller one. The larger ones have seeds in them, which are not edible. In come cases, the smaller lobe also contains a seed. The lobes are covered in film-like layer, similar to a boiled and peeled egg. This layer should be removed before eating. The texture of the flesh of the lobes is a bit like that of an apple. Depending on the type and ripeness of the fruit, the texture varies from crunchy to crumbly, with a mix of bitter, acidic and sweet flavors. Salak is particularly high in iron, phosphorus, vitamin C and calcium. Surprisingly, the fruit also contains almost 1 gram of dietary fiber per 100 grams. The below nutritional profile is from Wikipedia but I don’t think it’s complete. A full list of nutrients proves really hard to find, but according to other sources the fruit also contains good amounts of potassium and vitamins B1 and B2. Just like so many other fruits, salak offers antioxidants that help our bodies to combat and prevent diseases. Snake fruit is often referred to the “memory fruit”, supposedly due to its potassium content. Potassium is a mineral that supports various types of body functions, including the brain’s memory function. The calcium in snake fruit supports the health, structure and functioning of our teeth and bones, and iron helps to preserve vital functions in the body, including maintaining energy levels and focus. I should also mention that, according to several sources, snake fruit has anti-diarrheal properties. In other words, eating too much of the fruit can lead to constipation. Well, isn’t that interesting? So there you have it, an introduction to snake fruit, another exotic treat you may have never seen or heard before. I truly love discovering fruits (and vegetables) that are just a bit different and more unique than what we can find in our local supermarkets. Our planet has so much to offer when it comes to fruits and vegetables and each has its own identity, with a unique set of nutrients and flavors. Have you read my post about cherimoya fruit yet? That’s another exotic treat with all the right flavors! Can You Eat Apple Seeds, or Are They Poisonous?